We are pleased to offer easy, no-hassle refunds on accessories and in-stock merchandise, within 30 days of your receipt of the items. All returned items must be unworn and in original packaging with tags affixed. Shipping fees will not be refunded. Dresses purchased from an authorized retailer fall under the retailer terms of service, and the following policies do not apply. 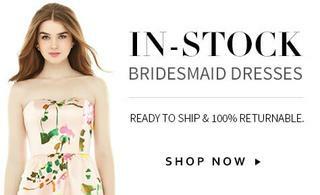 All in-stock dresses are 100% returnable. This includes in-stock bridesmaid dresses and twist dresses. All special order dresses are not returnable, all sales are final. If item is defective or damaged in shipment, please contact us. All fabric yardage, fabric swatches, and PANTONE paper Chiplettes are not returnable, all sales are final. We do not offer exchange service for products at this time. If you purchased your item/s on https://dessy.com and would like to exchange for a different size or style, you will need to return the item/s for a refund and place a new order for the correct item/s on https://dessy.com.